Do you hear what I hear? It's a band new Junk Food Dinner Holiday Spectacular! This year we invite you to snuggle up by the fire place and join us as we munch on three especially nutty fruitcakes of cinema. Up first, a pretty young mall employee with a severely damaged home life is befriended by a jolly, bearded man (with smoke encircling his head like a wreath) and together they must stop the Nazis from using evil elves and a magic crystal to create a master race in the deeply dark and disturbing ELVES from 1989. Next, "Hollywood" Hulk Hogan takes on Ed Begley Jr. and a host of character actors (Garrett Morris, Mila Kunis, Don Stark, Clint Howard, and more!) as they try and take over an orphanage! On Christmas! Can you believe the nerve? 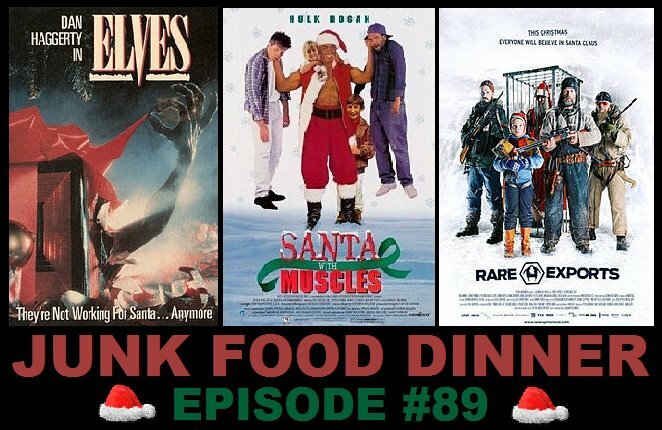 More magic crystals and groans abound as we take on 1996's SANTA WITH MUSCLES! If you missed it the two weeks it was in theaters in the mid-90's, now's your chance to get the scoop. Finally, we travel around the world to the icy tundra of Finland to take a look at a newer entry in the cannon of Holiday cult film. RARE EXPORTS from last year, a feature length film spawned from a series of viral short films, takes a look at the darker side of Santa mythology. A boy and his father feel the consequences of the archaeological dig when they uncover an ancient burial mound. Could the stranger found in their wolf trap have something to do with the rash of disappearances of the local children? All this plus an appearance by Virtual Mark, witty banter between friends, rock 'n roll music, glitchy Skype noise, a flaming Yule log, Nerd News, DVD & Blu-ray releases, and so much more! Also, if you like the show, please take a minute and subscribe and/or comment on us on iTunes, , Stitcher, Blubrry or Podfeed.net. We gain precious nutrients from your love and support. Thanks for the heads up on all these. I should probably go through them all one day and make sure they all work. This one, though, worked fine for me. Try again and see if it's still not working and I'll try to figure something out. Should work, though.